The FONIX 8000 Hearing Aid Test System is a direct descendent of the FONIX 7000 Hearing Aid Test System, prized by hearing health professionals the world over for its dependability, accuracy, and advanced testing capability. The new FONIX 8000 advances the science of hearing aid testing even farther with the introduction of the optional 8120 Polar Plot Sound Chamber. The FONIX 8000 Hearing Aid Test System has a Polar Plot Option that includes a new test screen capable of performing polar plots of directional hearing aids and giving you a much better picture of the directional characteristics of these hearing aids. Although the results are not a replacement for laboratory testing using an anechoic chamber, the 8120 Polar Plot chamber provides the hearing health professional with a clinical tool for verifying approximate directionality characteristics of the hearing aid. In the 8120 Polar Plot chamber, the hearing aid is mounted on a rotating spindle in front of the sound chamber speaker. During the polar plot test, the FONIX 8000 Hearing Aid Test System automatically rotates the hearing aid in a 360 degree circle, taking measurements at angles specified by the user. Results are displayed in polar plot format on the test screen in either dB Gain or dB SPL. The FONIX 8000 Hearing Aid Test System can be purchased with the ANSI S3.22 87/96/03, IEC 60118-7 94/05, JIS 2000, or a combination of these test sequences. 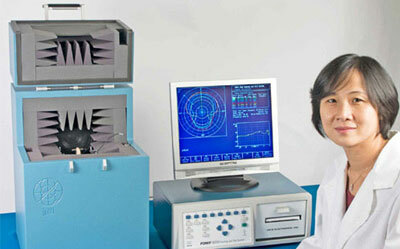 This makes the 8000 Test System capable of testing hearing aids manufactured and sold in countries all over the world. Alternately, you can build your own automated test sequence with the Auto Test feature available in the Coupler Multicurve screen. Using Auto Test, you can program the source type and level of up to ten different frequency response curves. You can even add pauses to the test sequence to give you time to adjust the hearing aid in between measurements. Three different custom sequences are available for each user. These tests can be loaded automatically, creating a one-button test sequence that is fully customizable for the needs of the clinic. 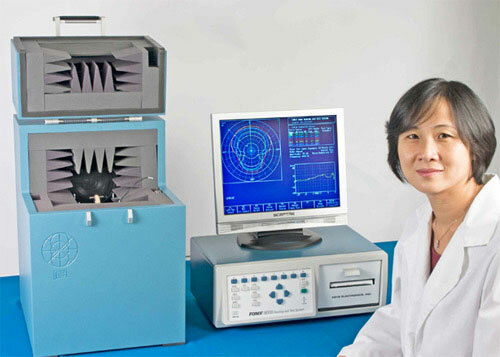 Enhanced DSP is an innovative test unique to the FONIX line of hearing aid analyzers. It tests the signal processing delay and the phase of the digital hearing aids. Signal processing delay is the time it takes for the hearing aid to process sound through its circuits. In a monaural or open fitting, unaided sound can reach the ear faster than it can travel through the hearing aid, potentially causing localization problems or “echoing” effects. In some cases, the digital signal processing delay of the hearing aid can be up to 15 ms, although more commonly it is in the range of 3-6 ms. Phase is a measurement of how the hearing aid pushes and pulls sound through the receiver of the hearing aid. For a pair of aids in a binaural set to be working properly together, both aids must be “pushing” and “pulling” in the same manner. If the phase test shows opposite graphs, it’s possible that one of the components inside the hearing aid was wired backwards, decreasing the fidelity of the total signal. The phase test gives you the ability to quickly determine if the hearing aids are working together as a team. The FONIX 8000 Hearing Aid Test System comes equipped with the Digital Speech signal. This is a modulated broadband signal for testing digital hearing aids. Many digital hearing aids have noise suppression technology. When part of the input signal is constant (such as a conventional test signal), the hearing aid does not amplify it as much as the part of the input signal that is modulated, such as a speech signal. The modulation in the Digital Speech signal typically causes the hearing aid to amplify the signal instead of suppressing it. As an additional feature, the Digital Speech signal has the option of adding a Bias Tone. The Bias Tone creates a continuous signal at a selected frequency. This allows the user to determine how the hearing aid reacts in the presence of noise at various frequencies. This can also show the behavior of the hearing aid in channels where the noise is not present. If there is noise at 500 Hz, does the hearing aid suppress the signal at 4000 Hz? The Bias Tone can tell you exactly what’s going on when part of the test signal contains a continuous input. Unlike many competing systems, the FONIX 8000 Hearing Aid Test System does not use a feedback microphone as part of its coupler measurements. Instead, we use a “leveling” system in which the sound chamber is leveled with the measurement microphone before the coupler measurements are taken. This makes our coupler measurements extremely fast because the feedback microphone does not need to be part of the measurement system. The leveling system also has the added feature of not interfering with the measurement of popular open fit hearing aids. In a feedback system, the open fit hearing aids can interfere with the feedback microphone measurement and thus decrease the accuracy of the test. However, with our leveling system, there is no possibility of this occurring. These new pills (#675, #13, #312, #10) conform to the ANSI S3.22 Hearing Aid Specification Standard. When you connect a battery pill to the analyzer, the 8000 automatically detects its size and chemistry. The pills are also color-coded for easy identification. For more information click to download PDF.